How old is #MapLesotho? It’s hard to say,… though as a big crowdsource effort it began in July 2014, making it about a year old now. Of course the effort goes back further to February 2014 when Basotho Planners and the Fingal County Council trainers started mapping in Ha Foso, just to the north east of Maseru. This endeavour produced around 100,000 nodes. And before that only 13 mappers had mapped Lesotho producing approximately 30,000 nodes. These were a mix of data imports and a few isolated N.G.O. aid agencies who had a logistical reason, and some GPS capacity on their phones. But in terms of the crowdsource very little happened until late July 2014 when a number of mapathons were held in different venues across the globe. The crowdsource was helped very much by Dave Corley, and also the support for the Basotho Community by Fingal County Council trainers helped keep a peer group in country. The first #hotosm task was set up at eastern Maseru. This was soon abandoned to facilitate Basotho mappers having areas important to them to map. A further six tasks were set up. However, at the completion of this stage there were only 500,000 nodes. 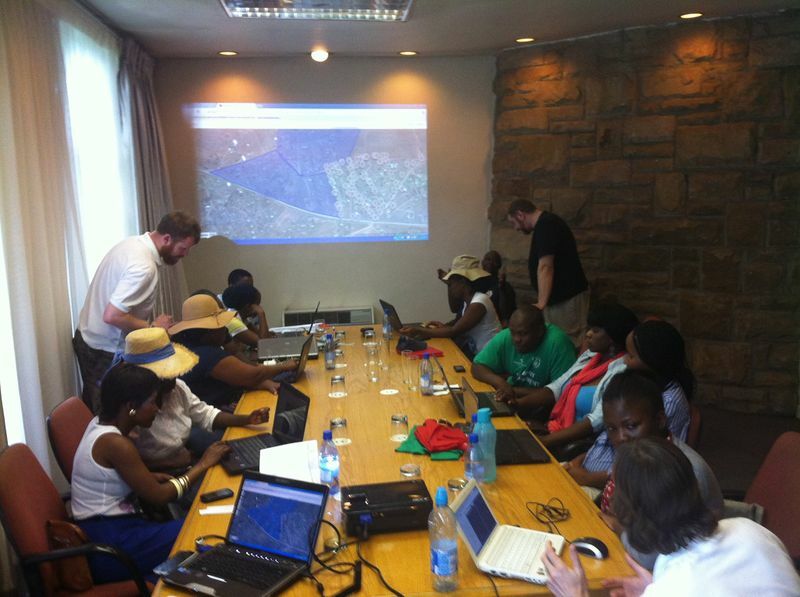 The July 2014 Mapathons created huge visibility for Lesotho and #MapLesotho. 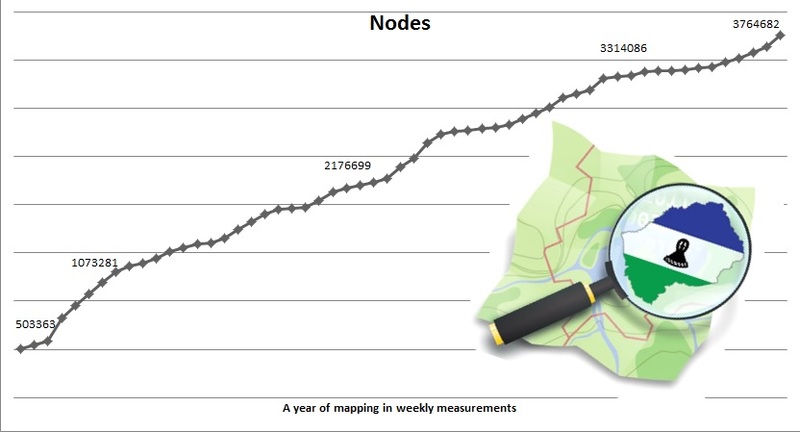 The 1 million nodes mark was reached within seven weeks of the mapathons, showing that #hotosm users liked the idea of a meeting place online. Upon reaching the population to node convergence of one node for every Basotho person our “statto in residence” Soren tweeted and blogged about a tipping point being reached, after which mapping could only accelerate. That was November 2014, and how right he was! The Fingal County Council trainers visited Lesotho in February, and the extension of training to larger numbers of people there increased the level of mapping up to 3 million Nodes. Now, just six months later the node count is 3.75 million. And the target is to get it to 4 million before the end of September. The end of the “base-map” task is in sight. New tasks will start to exist shortly that will edit the map in much greater detail. Using the Mapillary app, Walking papers, Bodlean Library maps, bulk uploads of Land Administration open data, and more local community initiatives to provide detail to the map data will produce a Map of Lesotho that will be the envy of other African countries. As the tasks proceed the necessity for the international crowdsource will wane, though not disappear entirely. Happy Birthday to the #MapLesotho Crowdsource, in reaching a year of activity this week!